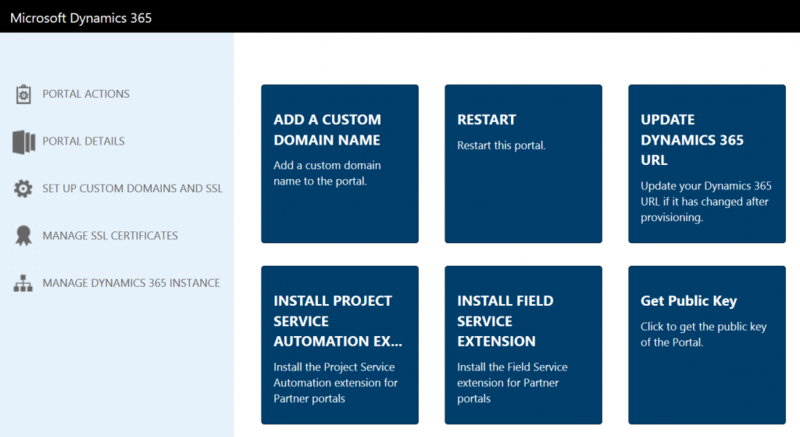 Provisioning Dynamics 365 Portals (aka CRM Portals formerly known as Adxstudio) is quite a simple process. 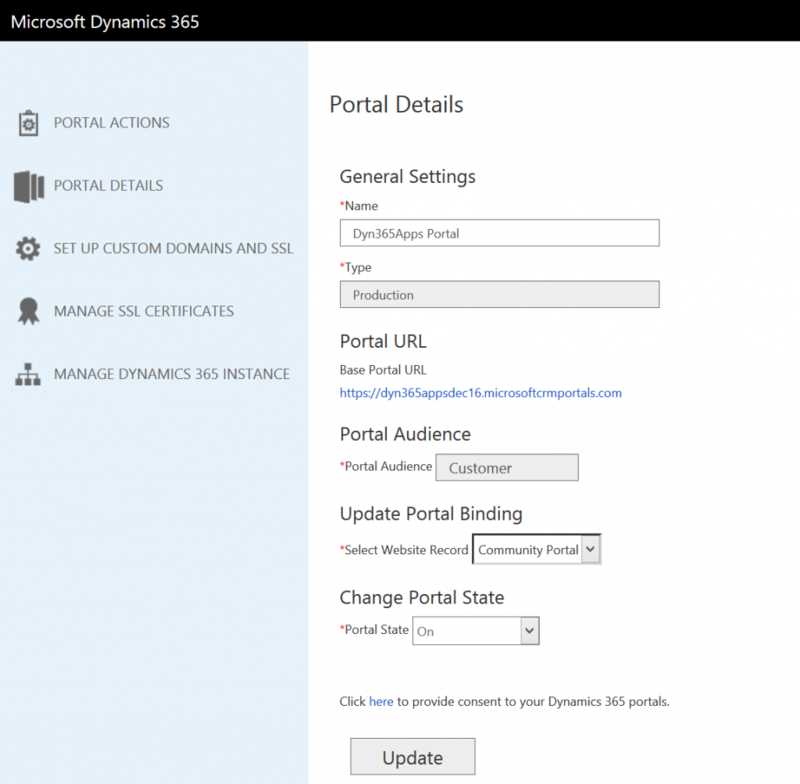 In this article, I will detail step by step process to provision Dynamics 365 Portal. 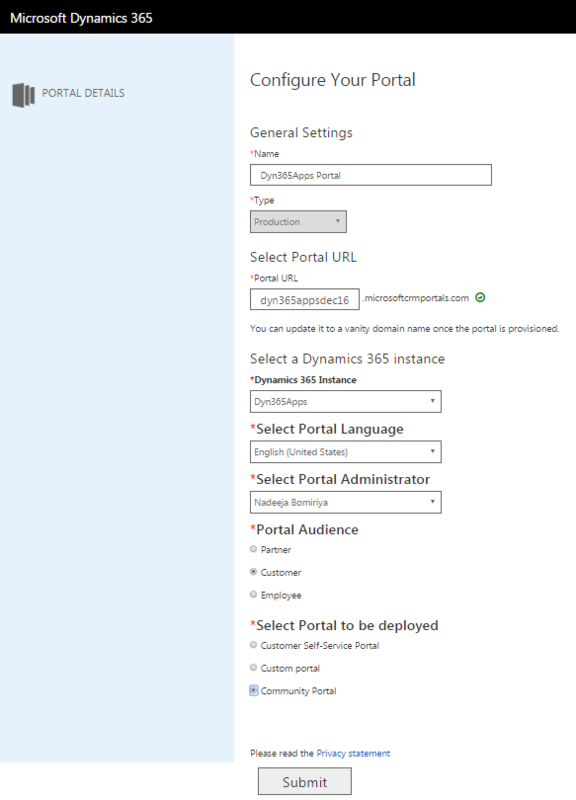 If you are evaluating Dynamics 365 (CRM) and Dynamics 365 Portals, first step is to sign up for a Dynamics 365 trial environment. This process only takes few minutes. 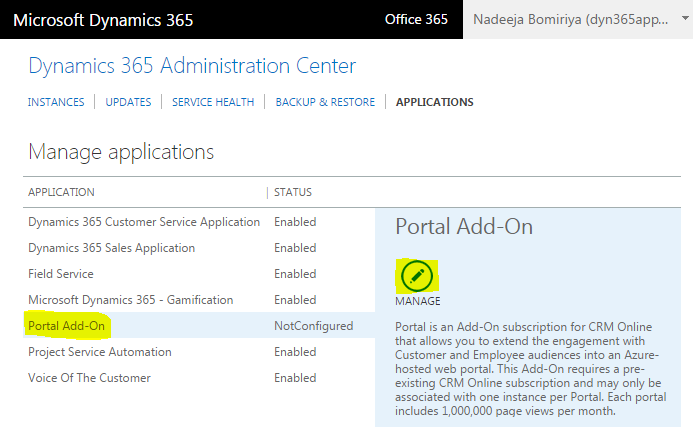 Once you have the Dynamics 365 (CRM) is provisioned, you can start provisioning the Dynamics 365 Portals. Under Admin Centers, click CRM. New window/tab opens. Click on Applications and under Manage Application table, click on Portal Add-on. Again, another window/tab opens. Configure the Portal. Enter a name and Portal URL. 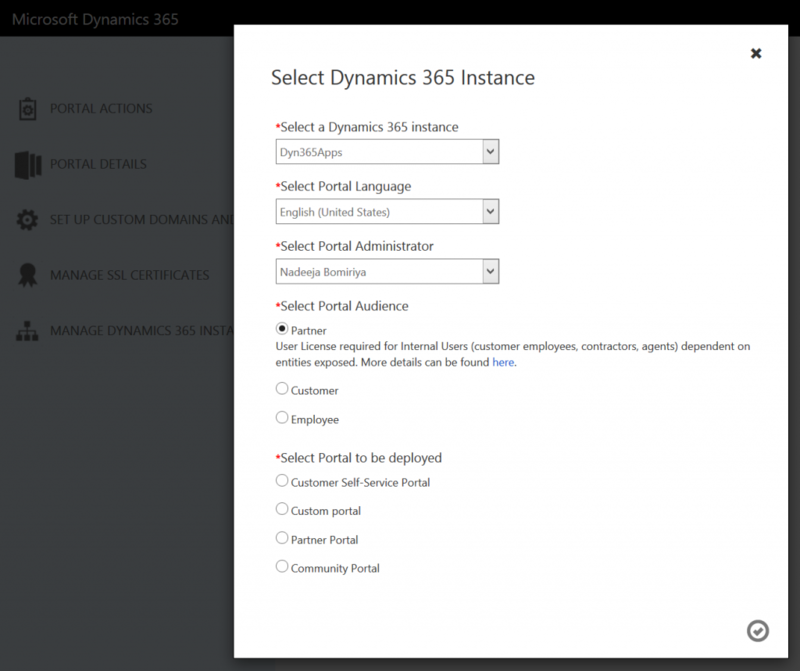 Select Dynamics 365 Instance, Portal Language, and Portal Administrator. Select one of below options under Portal Audience. Select one of the below option under Portal to be deployed. This setting will install the appropriate Portal solution. 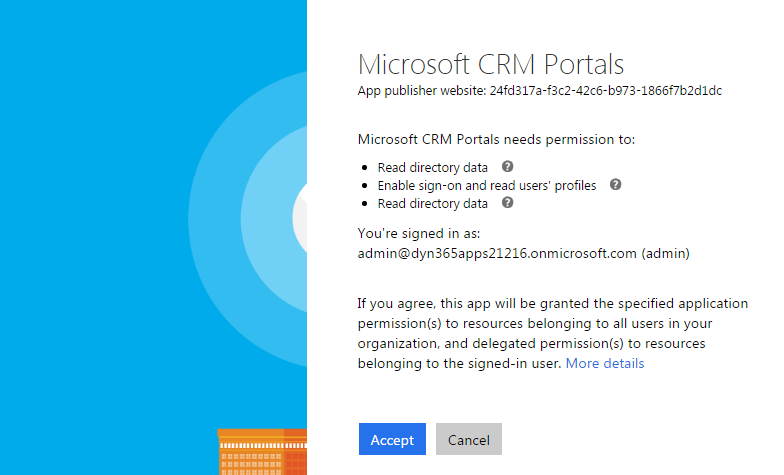 You will be asked to login again and accept to provide certain permissions to access Dynamics 365 (CRM) and Office 365 data. Read directory data – Allows the app to read data in your organization’s directory, such as users, groups and apps, without a signed-in user. Enable sign-on and read users’ profiles – Allow users to sign in to the application with their organizational accounts and let the application read the profiles of signed-in users, such as their email address and contact information. Let’s check to see if the Portal Add-on is enabled and solution is installed correctly. 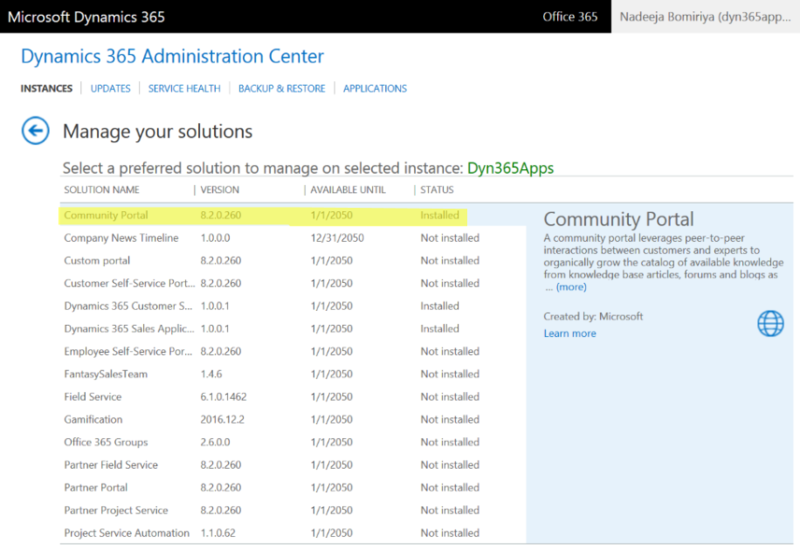 Navigate to Dynamics 365 Administration Center. Click on Applications. As you can see below, the portal add-on is enabled. Now click on Instances, select an instance, and click Solutions on the right hand pane. 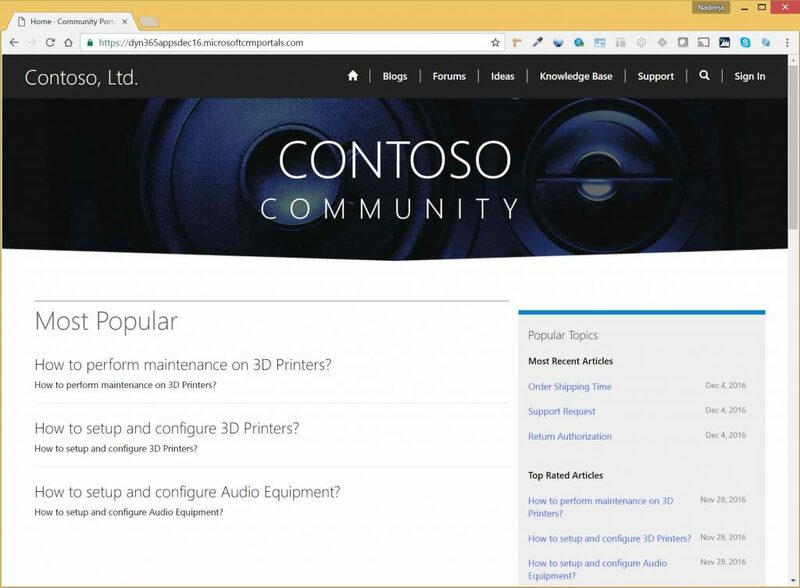 Notice that the Community Portal solution is now installed. 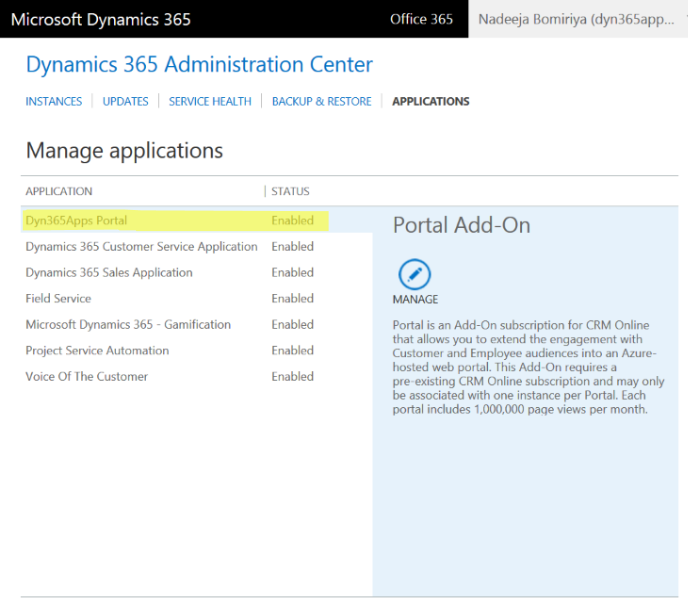 If you need to manage the Portal, navigate to Applications in Dynamics 365 Administration Center, select the Portal Application and click Manage on the right pane. A new window/tab opens. To view Portal details, click on the PORTAL DETAILS link from left pane. You can see the URL of the Portal and you can also turn On and Off the Portal. 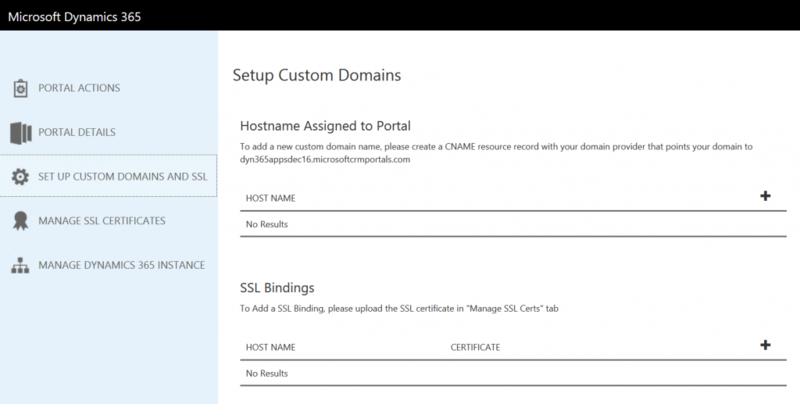 Click on SETUP CUSTOM DOMAINS AND SSL to do just that. To upload custom SSL certificates, click on MANAGE SSL CERTIFICATES. Finally, to manage Dynamics 365 Instance, click MANAGE DYNAMICS 365 INSTANCE. It’s time to check out our brand new portal.